Flavius Valens was the younger brother of Valentinian I born in 328 AD at Cibalae in Pannomia. Following the death of the Emperor Jovian, Valentinian I was proclaimed Emperor and in return he raised his brother Valens to the rank of co-Emperor. 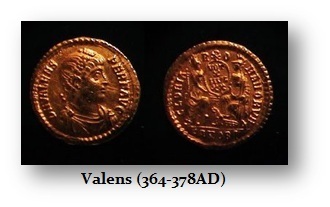 Valens thus became Emperor of the Eastern provinces. For much of his 14 year reign, Valens spent his time defending the Eastern Empire against the Persians and on the Danube against the Goths. Finally, Attila the Hun made his appearance. In 376 AD, Attilia swept across much of northern regions of the empire. Even the Goths applied to Valens for relief by allowing them the cross the Danube and settle peacefully within Roman territory. Valens, deciding that the Goths might provide at least a buffer against the Huns, agreed to the petition and the Goths began a mass migration. However, once settled within Roman territory, the Goths found themselves persecuted and badly treated by the local Roman inhabitants. This harsh treatment could no longer be endured and the Goths rebelled. Valens was forced to march against them with disastrous consequences. Valens met his death on August 9th, 378 AD in one of the greatest military catastrophes ever suffered by the Roman Legions – the Battle of Aadrianopolis. It was in this fateful battle to the death with the Goths where the legions of Rome were totally annihilated. The devastation and carnage was so vast that the body of the Emperor Valens was never recovered. This battle was one of the worst defeats ever suffered by Rome. No one before had ever totally destroyed the powerful legions of the Roman army while under the personal command of an Emperor himself. The body of Valens was never found. NOTE: Many silver issues of Valens were struck in the West, suggesting that there was a significant increase in production of silver after Valentinian’s death in 375 AD.